» MSR WindBurner vs Jetboil MiniMo – Which Stove Should You Buy? MSR WindBurner vs Jetboil MiniMo – Which Stove Should You Buy? 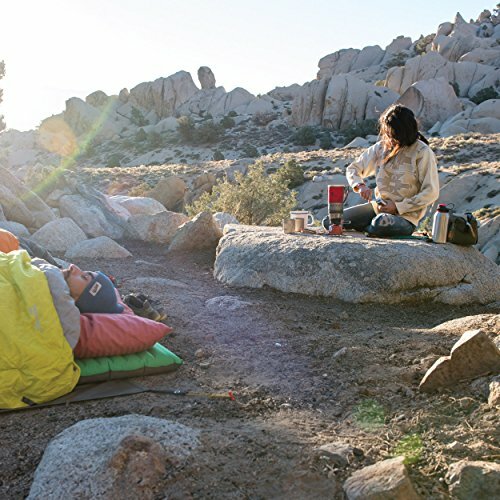 Few things compare to eating a warm, hearty meal after a long day’s hike or waking up on a chilly morning and making a cup of hot coffee right outside your tent. Camp stoves are an efficient way of heating water and food that has all but made campfires pointless – save for those casual camping trips where nostalgia trumps the need for boiling water as quickly as possible. There are hundreds of different designs of camp stoves that have developed over the years. You can easily find propane stoves in your stores, even in your local Walmart. Other brands market more towards serious outdoor enthusiasts, particularly those needing a light, fast-heating stove for thru-hiking or mountaineering. Those looking for a camp stove that is easy to use, lightweight and compact, and overall designed for handling frequent use there are a few popular brands to choose from. 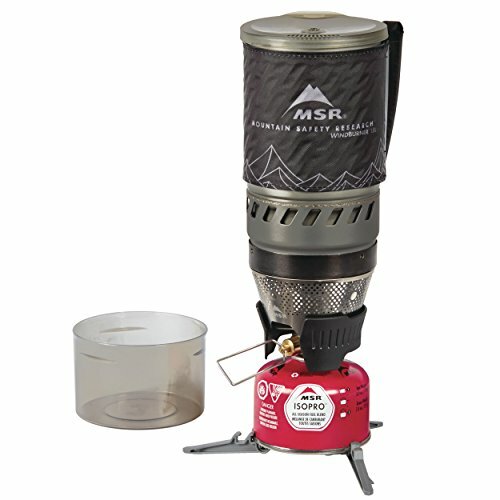 Two very reputable options are MSR and JetBoil. MSR, Mountain Safety Research, is an outdoor gear brand that original focuses on climbing equipment, though it has since expanded to carry almost all types of outdoor-related gear. 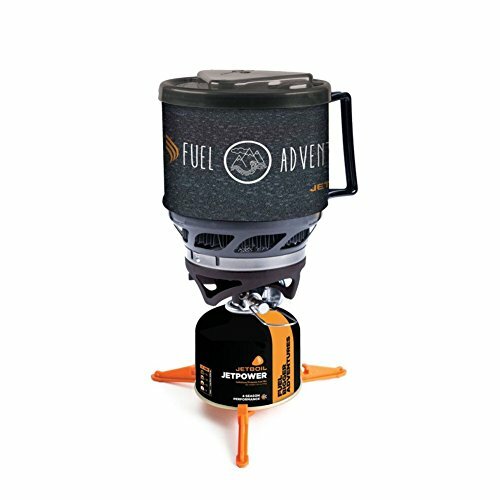 They have a nice selection of camp stove systems, including liquid fuel and canister models. The MSR WindBurner comes highly recommended by many hikers and campers. 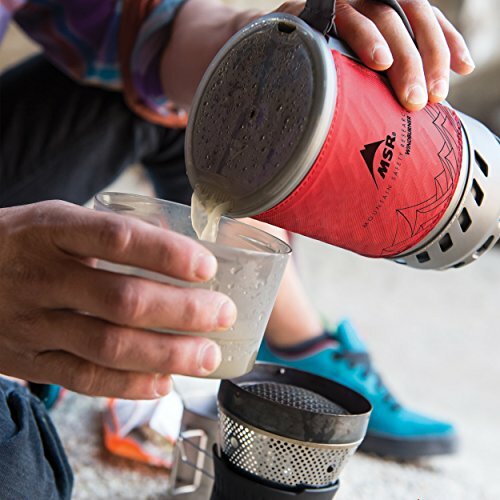 Jetboil was founded in 2001 specifically to address issues with backcountry cooking – namely the lack of high-efficiency, compact camp stoves. JetBoil specifically focuses on camp stoves and cookware. Considering the idea of, “jack-of-all-trades master of none”, JetBoil’s sole purpose of making the best camp stoves really shows. They offer five different stove types – Basecamp, Cook & Boil, Boil-Only, Lightweight, and 4-Season. A new model of theirs, the MiniMo, is already showing great promise. If you’re searching for a new camp stove and these models caught your eye, here’s how they stack up. The WindBurner Personal Stove System has numerous positive reviews backing it and it’s one of the top-rated stoves from MSR. MSR described the WindBurner as a “windproof, modular personal stove system”. Although nearly the Windburner can be used really in any situation, it’s particularly ideal for solo hikers, light or UL backpacking trips, or in instances where fast boiling is a must. A large part of the Windburner’s successful design is the windproof, radiant burner Reactor technology. This award-winning feature is incredibly efficient, allowing faster boiling times and great fuel efficiency than similar-sized camp stoves. Additionally, the Windburner performs exceptionally well in cold conditions. Being a modular system, all the basics you need for cooking are in this kit. The stove has a nesting configuration, allowing the cookware to be stored within the stove. Aside from the burner itself, the WindBurner comes with a 1L cook pot and a full-sized bowl (0.5L) that snaps onto the outside of the stove. You can easily add your own folding cooking/eating utensils into the body of the stove. If you want more options, you’ll be happy to know that MSR has a WindBurner cookware collection, allowing you to add accessories. For example, if you need more than a 1L pot, the WindBurner collection 1.8 Duo Pot can be purchased separately. Other important things to know is that the WindBurner has a pressure regulator as well as a boil-to-simmer control. The pot is made of hard-anodized aluminum and has a built-in heat exchanger, in addition to a cozy to protect your hands. The lid is made for drinking, straining, and pouring, and is BPA-free. Color options for the WindBurner are either Red or Black, with either system retailing for $149.95. Total weight is 15.3 oz. Average boil time is 4.5 minutes for 1 liter of water. You can boil a total of 18 liters of water with one 227 gram fuel can. The JetBoil MiniMo is one of JetBoil’s most popular regulated cook stove systems. This model is designed for personal/individual use, but unlike many solo stoves, the MiniMo isn’t just for boiling water. JetBoil created the MiniMo for actual cooking. One of the first things customers note is how sturdy the cooking cup is, including the metal handle. Though it may be compact, there is nothing delicate about this system. The cooking cup has a standard 1L capacity and the cup itself allows for a low utensils angle, making it easier to stir and eat from. As mentioned, the MiniMo is a regulated cookstove system. This means this model doesn’t just boil water quickly but also allows you to control the heat. If you’re cooking a meal and not just boiling water, you can turn the burner down to a simmer. Additionally, the MiniMo performs very well in cold conditions. JetBoil tested it down to 20F and it still performed perfectly. The MiniMo is very user-friendly. It ignites with a push button and the easy dial control the intensity of the flame. The lid of the cooking cup is insulated, allowing you to drink from it. There is also a measuring cup to make portioning out water for a dehydrated meal very easy. This is a compact stove and the burner stores in an unusual sideways position for maximum space savings. 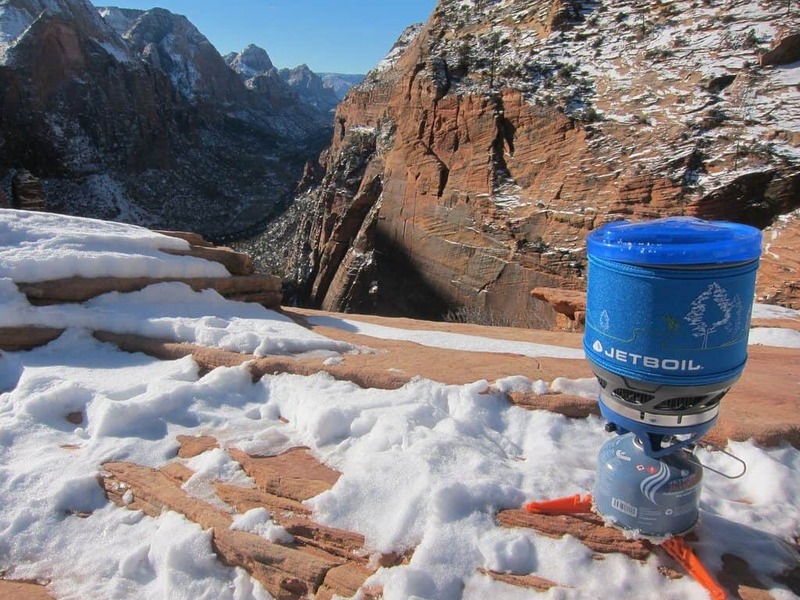 JetBoil includes the Fuel Canister Stabilizer, but the Jetpower Fuel and Pot Support are sold separately. Jetboil also offers a nice range of accessories to go with the MiniMo, including a Coffee Press and a Hanging Kit. The MiniMo retails for $134.95 and comes in four colors/prints. (Check out the latest rates here!) Total weight is 14/6 oz. Boil time is roughly 2 minutes and 15 seconds. You can boil a total of 12 liters of water with one 100 gram Jetpower fuel can. Which Stove Is for You? Both the MSR WindBurner and the JetBoil MiniMo are excellent quality stoves. They share quite a few similarities, but knowing a couple differences between their specs can help you decide which is the right model for your purposes. The WindBurner and the MiniMo are personal-sized cooking stoves. They are ideal for just one person, though you could make two smaller meals for you and a partner. Both stoves have regulatory abilities, allowing you to control the heat to allow for a full boil or a more gentle simmer. These are true camp stoves, meaning you can cook with them versus a boil-only stove design. That being said, if you regularly plan on cooking directly over the stove, chances are you’ll find that the MiniMo is easier to use. The MiniMo is just a little lighter in weight than the WindBurner, a bit less expensive, and very well built. Although it can cook down to 20F temperatures, some users have found it can struggle in high winds. Those that regular cook in windy or generally inclement weather conditions will be happier with the windproof abilities of the WindBurner. If you’re having to boil a lot of water during one trip, the WindBurner will likely be a better choice as well. However, one Jetpower fuel can will heat 12 liters of water and weighs 100 grams. Therefore you could carry an extra fuel can if you’re really interested in the MiniMo the most. Overall the similarities these two shares can make it difficult to stack them against one another. Consider the points above and visit the brand’s respective websites to see which stands out the most to you.